After having his hand eaten by a school of pirrhana, Aquaman donned a cybernetic harpoon and sunk into the depths of depression. It was at this point that Dolphin entered his life, begining a romantic relationship that didn't last. Aquaman has recently replaced his harpoon with a cybernetic gauntlet that functions in place of his hand. Aquaman was a Total Justice Aquaman (duh), with the harpoon cut off and a section of the left arm of Superman, the Mold They Use for Everything, painted gold. 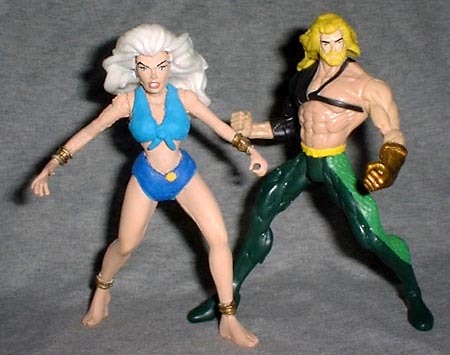 Dolphin was a Savage Land Storm body (for the bare feet) with the crop top and cutoffs added in clay, and the head of a Water Wars Storm for that flowing, underwater hair look. The only thing I really don't like are the big, awful eyes, so I should probably redo those sometime. Aquaman has five points of articulation, and Dolphin has only four. Both figures are approximately 5" tall. Better Aquaman: pre- or post-harpoon? Tell us on our message board, the Loafing Lounge.